The first part of any project, print or digital, should start on paper. Sketching can be an integral part of any design process — even if you can’t draw. But who needs to sketch? Just artists and illustrators are required to put pen to paper, right? Wrong! Today we’ll take a look at why sketching can be an integral part of everyone’s design and brainstorming process. Everyone involved in the design process of anything, printed or digital. From newspapers to books to business cards to websites or mobile apps, every design project should start with a sketch. And you don’t have to know how to draw. Sketching is brainstorming tool that can help you develop ideas individually or as part of a team. The biggest pitfall of teaching someone to sketch, is helping him or her to understand that it’s just a simple drawing. A sketch does not contain a lot of detail or refinement (well, it doesn’t have to). What a sketch does is give you an idea of where the design might be headed. It is a place to create a great shape, or detail key words or elements that a project should include. Sketches are often just preliminary suggestions of what a project can come to be as it develops throughout the design process and workflow. So how do you get started? Start carrying a notebook and pen or pencil almost everywhere. You never know when a little inspiration will hit you. And when you come up with an idea – any idea – you should get it on paper right away. Plan meetings where participants will be expected to sketch. (Just make sure to have plenty of pens and paper on hand.) By encouraging the habit for members of your team, sketching will become almost second nature in no time. And then just draw. It is important to distinguish the difference between doodling and sketching here. Coloring letters on an agenda or drawing flowers in the margin of a handout is not sketching. That’s a doodle. Sketching will have a purpose or intent that extends beyond boredom. Sketching does a variety of things when it comes to the creative process. It is one of the purest forms of brainstorming for designers because you can create a quick, simple, inexpensive visuals that can be shared with others. You can create as many sketches as you want without a lot of additional time or cost. And sketches are easy to share (or trash). Sketching helps you show, not tell (as the expression goes). With a sketch you can show a concept to a team or client, come up with potential solutions quickly, and help better understand a project yourself. While sketching can take on a number of forms, it has a few common uses and applications for creatives. Sketching can help you develop a concept quickly. Because the visual nature of a sketch can help other people “see what you are thinking,” the design process can get a boost in the early phases. Sketching gives you a basic outline or concept that can be shared. Often in my days as a newspaper designer, I would sketch the placement of stories and images on a page during meetings so I could show editors what the front page of tomorrow’s paper would look like before I ever touched a keyboard. The same idea extends to almost every type of design work. Imagine you need a photo for a new website concept. You can sketch what the image should be before the photographer heads out with a camera so that you are thinking about the project in the same way. Sketching can show the evolution of a project and help you go back to early ideas without having to keep a bunch of detailed records. By flipping back a few pages in a notebook, you can see how a project has changed and what elements were added or removed. The sketches of Twitter bird logos, which were found and released by Slate last year, show a great evolution of ideas and concepts for what came to be a pretty famous logo. There are dozens of ideas that turned into a single, simple blue bird. Personally, I sketch partially out of habit and partially as a way to officially start a new project. Sketching really helps me clear my mind of past projects and really focus on the task at hand. I started sketching in college when I was trying to figure out how to design newspaper pages. I still sketch almost everything out to this day, from website concepts, to what my next business cards might look like, to helping students brainstorm their own design projects. Less important is how to sketch and more important is that you incorporate it into your design processes. There are a few basic sketching tools that can encourage you to visualize ideas. Pens: Fine-tipped markers are a favorite. But try a variety of pen types to see what you like. Try: Sharpie Fine Point Pen. Pencils: While quite a few designers prefer the classic wooden model, I am a fan of mechanical pencils with erasers. No sharpening required. Try: Pentel Graph Gear 1000 Mechanical Drafting Pencil. Notebooks and paper: Keep piles of scrap paper or sticky notes available at design stations for easy access during brainstorming meetings. Also consider notebooks for sketching. Try: Moleskine Sketchbook, pocket size. Dry erase boards: There’s nothing better than a big board for capturing ideas at meetings. Just remember to save each sketch by snapping a photo of it with a smartphone or tablet before moving on to the next thing. Try: Universal Dry Erase Easel. Regardless of where your final product will be published, sketching can help you better conceptualize, create and collaborate on design projects. 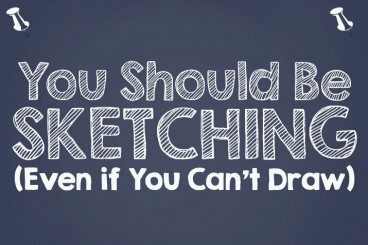 The art of the sketch is simple and one of the easiest to use brainstorming techniques. How often do you incorporate sketching into your workflow processes? Let us know in the comments. Image Sources: Kilo75 and shoesfullofdust.